My "shack" is in the basement which presented a bit of a problem of how to get the ladder line in. I have a MFJ window feedthrough but that doesn't work with the small sliding windows in the basement. 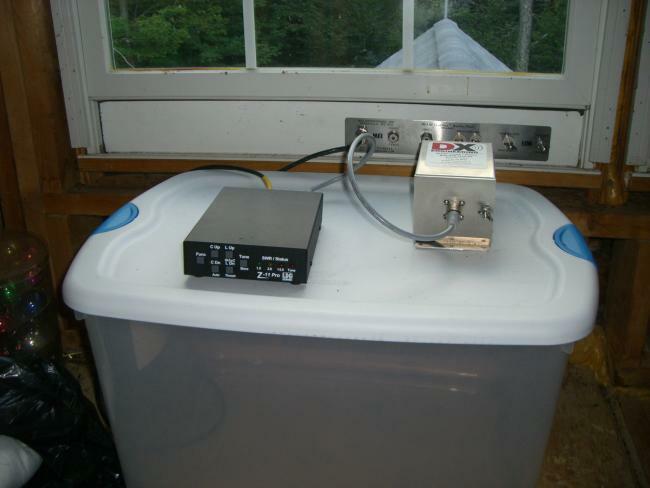 My solution is to bring the feedline in through a window into the attic where I have a balun and automatic antenna tuner. 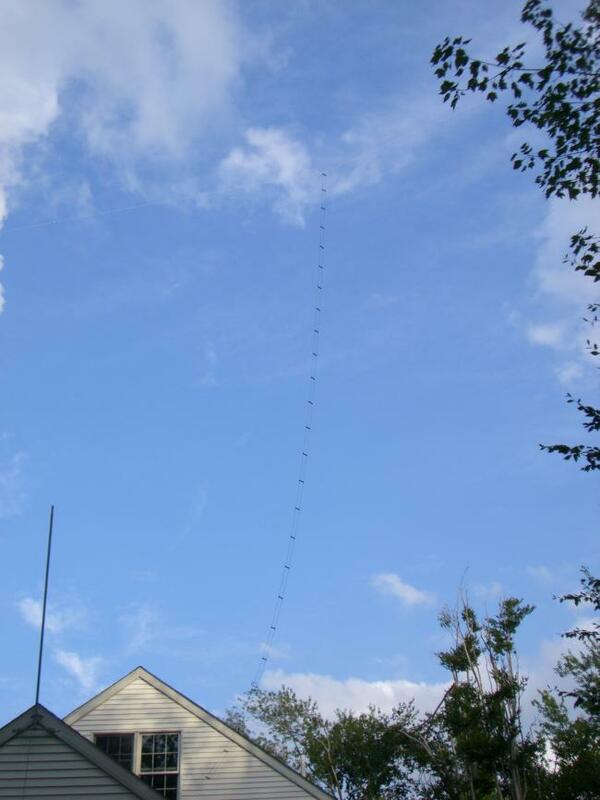 Coax then goes out the same window, down the side of the house and into the basement. It's working nicely on all bands 80 to 10m (well almost, see below). I've had considerable success working DX on both phone and CW. Until recently I haven't had much luck with automatic tuners. When I was on the air briefly in 2003 I purchased a SGC SG-239 which worked okay but I didn't have a good antenna. Then when I wanted to get on the air at the Mont Vernon QTH several years later, the SG-239 was pressed into service. It worked for a few hours and then refused to tune. I then decided to buy a LDG Z11-Pro. That worked well for a while until it overheated and burned a coil while operating on 20m CW. LDG happily repaired it under warranty but while it was away, I asked my dad in New Zealand to find and mail me my old MFJ-941D manual tuner. I used that successfully for several years and put the LDG away when it came back repaired. I can't easily use the manual tuner here because I don't have the ladder line coming into the shack like I did in Mont Vernon so I went back to the LDG and it's working well well. It runs on an internal set of AA flashlight batteries. It uses latching relays so it draws very little power except when it tunes but it seldom needs to actually tune because it can return immediately to a previous setting in its memory for that frequency. The batteries can last a couple of years. My experience is that the center fed doublet with ladder line to a tuner is a great multiband antenna. I think it is sometimes overlooked by new hams who are more likely to turn to the G5RV for multiband use. It's a similar antenna and I don't think there is anything "wrong" with the G5RV so long as people recognize its limitations when trying to use it without a tuner. It can be a subject of heated debates on places like the qrz.com antenna forum. The common configuration for the G5RV is ladder or window line for a certain length and then coax to the shack. People seem to spend a lot of time messing with the length of antenna or feedline trying to get an acceptable SWR on multiple bands. I would much prefer to have ladder line all the way to a tuner and not need to bother too much about measurements. I cut my doublet to 132 ft (40.2m) mostly because I followed the common instructions that say to make it a half wave on the lowest frequency. I wonder now if I should have made it a little different to avoid extremes of impedence. On 40m it becomes a center fed full wave dipole so the impedence in the center is quite high but despite that, the tuner seems to cope with it. Of course the impedence seen by the tuner depends on the length of the feedline. I don't mean to imply that the ladder line doublet is the perfect antenna. It's never going to substitute for a beam if you're really into busting pileups while chasing rare dx. 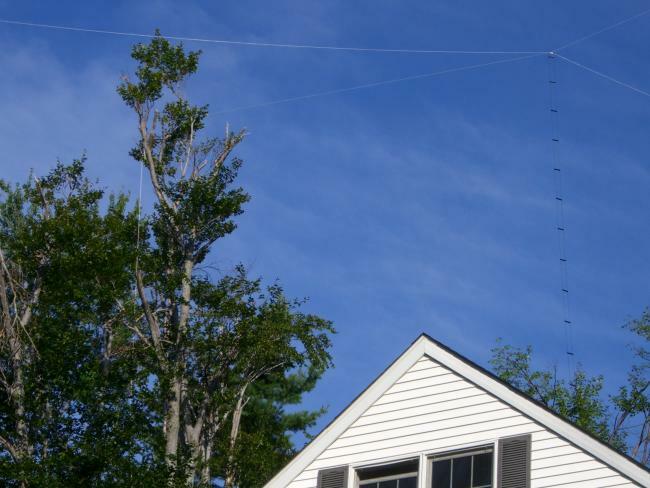 It's a compromise and dealing with ladder line requires more care than coax but if you can make it work, it's a great way to have fun on all HF bands with a single wire antenna. The radiation pattern on the higher bands is complex with many lobes like the petals of a flower which means that a game of chance determines whether or not you are "beaming" in the right direction for a particular station. I think the remote automatic tuner is a good way to avoid the hassles of getting ladder line into the shack. It's important to feed the line in a well balanced way. In earlier times, link coupled tank circuits or tuners were common. Transmitters often had two big insulated terminals on top for feeding ladder line. Not only does the current need to be of equal magnitude, it must also be opposite phase to avoid radiation from the feedline. These days it's more common to use a balun and a single ended tuner. The balun should be a current balun, not a voltage balun. Equal current is important, not equal voltage. If the antenna is perfectly balanced then equal voltage means equal current but in practice no antenna is perfectly balanced. Many tuners have a "balanced" output but it pays to check what is really inside. The balanced output in many lower cost tuners is fed from a rather low quality voltage balun. There is also some debate about whether the balun should be a 1:1 or 4:1. I think 4:1 has been quite popular in the past. This perhaps comes from the thought that the ladder line is higher impedence than coax so we need need to step down to get it closer to the coax impedence. On the forums, people who have modeled the antenna with software like EZNEC seem to make a fairly compelling argument that a 1:1 balun is more likely to present an impedence within the range of the tuner over a wide range of frequencies. The impedence will depend on the length of the ladder line so it's a bit of a gamble but I'm getting good results from a 1:1 current balun. After doing some reading and playing with a home brew balun, I finally took the lazy way out and splashed out on a serious balun. It's a DX Engineering BAL050-H10-AT. It's not cheap but I think it was a good investment. I don't have any hard evidence to show how good it is compared to a cheaper balun but I have a feeling that it contributes to the good performance I get with this antenna. I've had absolutely no "RF in the shack" or similar problems even at the old QTH when I had the ladder line coming into the shack. An interesting fact that I learned from the forums is the reason ladder line works more successfully than coax in a multiband situation like this. The common belief is that ladder line "doesn't care" about high SWR. It's true that ladder line usually has lower loss than coax at a given SWR but that's not the whole story. Another rather simple factor is that the characteristic impedence of ladder line is higher than coax so therefore, for a typical wire antenna over a wide range of frequency, the average SWR on ladder line tends to be lower than it would be with coax and that helps keep the loss low. The only band segment that I can't tune with this antenna and the LDG Z11-Pro is the low end of 80m below about 3.650 MHz. The tuner gives up when it tries. I could probably change the length of the ladder line or the antenna but I haven't bothered because I don't use 80m much, it might mess up the other bands and the current ladder line length is a nice natural fit. As an experiment I tried the MFJ manual tuner in the attic and that tuned effortlessly on 3.501 MHz so I have that option if I really want to operate on 80m CW. I still have the old broken SG-239 tuner and from what I've read, the reason it stopped working is most likely because the sensing diodes have failed. I plan to repair it and see how its tuning range compares with the LDG. The ladder line came from http://trueladderline.com and I used a Hyper_Hanger to get ropes over four trees. There is a tree at each end of the antenna plus a perpendicular rope helping hold the center up. I think the center is up at least 70 ft. I'm fortunate to have plenty of trees around here. Anyway ... I'm very happy with my new antenna. Here's some photos.